Stay tuned for upcoming events for Pakistan vs Egypt in near future. 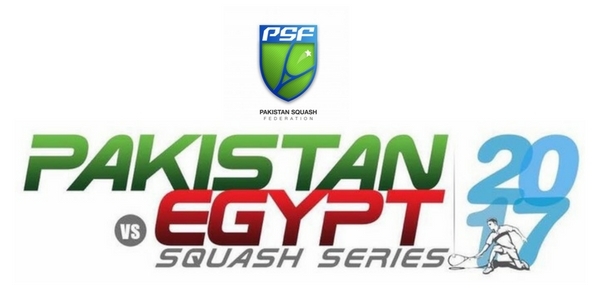 Pakistan Squash Federation (PSF) honorary secretary Group Captain Tahir Sultan has confirmed that the federation is organising two back-to-back squash series against world and Egyptian players from July 12 to 16 here at Mushaf Squash Complex. Addressing a press conference along with Pakistan Air Force (PAF) director media affairs M Ali, PNSA director Air Commodore (R) Aftab Ahmed Qureshi, Qamar Zaman and Serena Hotels manager sports diplomacy Hussain Odhwani, Tahir said: “We are working with commitment and providing the best facilities to our players by appointing top class coaches and taking squash legends onboard, who are working day and night to ensure international squash returns to Pakistan. “We had successfully hosted seven international tournaments in last two years. It was unfortunate that the PSA banned Pakistan for conducting the PSA events on the report of Sports Risk Group, but now they are scheduled to visit the country and hopefully after watching our arrangements, they will file a fact-based report, which will help in reviving international squash in the country,” he added. Tahir said on the directives of the PSF chief, they had planned two major exhibition series against World-V and Egyptian-V. “World number 2 Egyptian Karim Abdel Gawad and other top ranked players from Egypt will be in acting in Egypt-V versus Pakistan-V, while likes of Leo Au, Karaim Al-Fathi, Todd Harrity and Nathan Lake will play from World-V,” he added. He said the federation has been putting tremendous efforts for the promotion of squash in the country, while in absence of international squash, the PSF has intended to send a message across that Pakistan has potential to conduct mega squash activities and can host top world players in a befitting manner. “Pakistan vs World-V series will be held on July 12 and 13, while Pakistan vs Egypt series will be played on July 15 and 16. The international players will arrive in Islamabad on July 11. “On the goodwill gesture, the PSF has attracted potential international and top Egyptian players for which, we are thankful to our valuable guests, who reciprocated open heartedly. Karim Abdel Gawad, who was world No 1 last month, is also featuring in Pakistan vs Egypt Squash series including Omar Moosad, besides Egyptian players while potential players from England, France, Hong Kong and USA will also be seen in action next week in Pakistan vs World-V series,” he added. Tahir said that these matches would not only project soft and safe image of the country to lure international bodies to reinstate Pakistan’s due share of international tournaments but also would provide optimum exposure to the junior players, who are proceeding for World Junior Individual Championship at Tauranga, New Zealand later this month. Terms & Conditions : All rights are reserved by organization. Best Viewed at 1024 x 768 pixels and above. This Page loaded in 0.06503 seconds on Tue, Apr 23, 2019 (20:56).